Last week, we discussed our team’s extensive experience and capabilities in commercial stairs design. 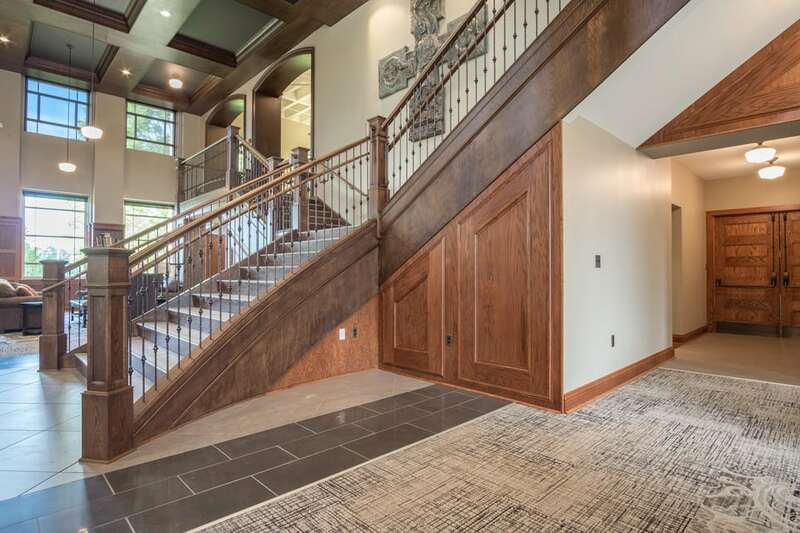 This week we continue our custom staircase series by featuring a beautiful commercial project in Cullman, Alabama, with classic red oak wood accents and genteel metal balusters. Our team leverages experience, advanced technology and a robust project management platform to ensure flawless execution of all phases of commercial stairs construction. From inspiration to installation, we are committed to quality, durability and client satisfaction. Highly creative and innovative, our design team loves a challenge. When we were approached with the task of designing this robust commercial stair for a prep school library in Cullman, Alabama, our team set to work to create the perfect staircase. 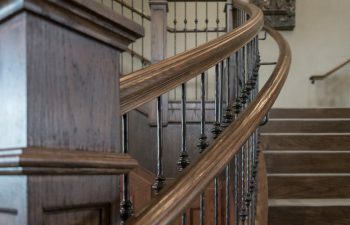 Our industry-leading team worked with the goal of creating a grand staircase that would perfectly complement the library’s sophisticated and traditional style. Commercial Stairs Construction – How did we do it? To construct this commercial stair with ultimate durability, aesthetics and lasting quality, the steel carriage was cladded in red oak wood. The result? An unbeatable combination of elegance and strength. 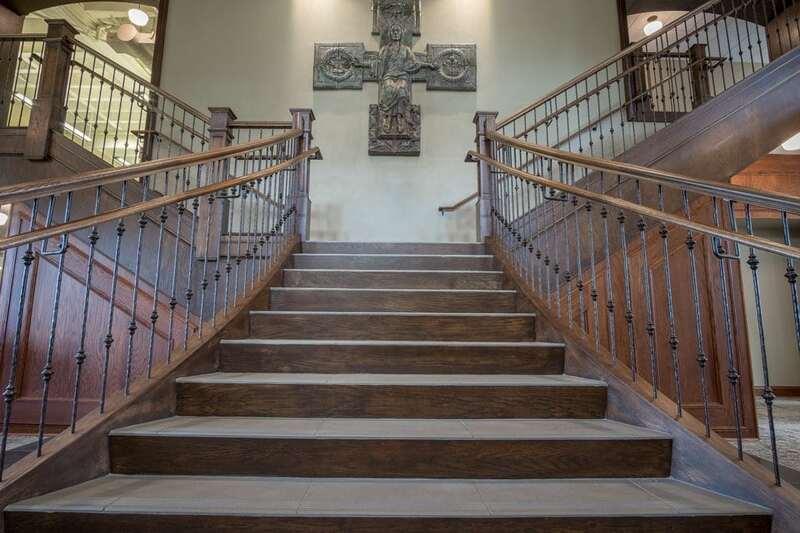 This commercial stair boasts both beauty and the ability to withstand decades of student traffic. To ensure a streamlined and flawless installation process, the commercial stair was constructed and delivered utilizing our turnkey approach. The stringers and complete rail system were designed and fabricated within our state-of-the-art facility in Alpharetta, Georgia. The staircase system was then shipped to the northern Alabama job site and installed by our professional team. To finish the space and create a polished, seamless look, our team also provided and installed wooden fascia boards which transformed the library rafters to match the staircase. Whether you are seeking a statuesque, traditional staircase or a commercial stair that displays modern minimalism, let this stair serve as an inspiration and example of our team’s capabilities. From inspiration to installation, our award-winning team will leverage ultimate skill to design, construct and deliver the perfect stair for your commercial space. Visit our commercial stairs project gallery for additional details and pictures on our monumental projects. From inspiration to installation our team is committed to designing and building the highest quality custom staircases. Our reputation speaks for itself and client satisfaction is our highest priority. Contact us today to discuss your next commercial stairs project.